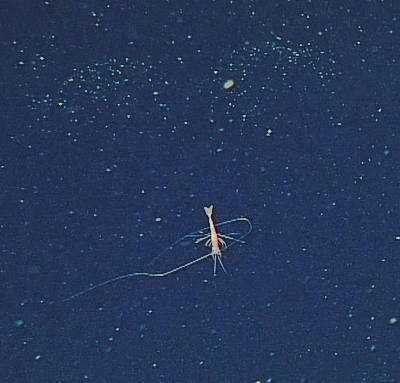 While exploring the depths of the Gulf of California with a robotic submarine, MBARI researchers saw an eerie sight: a small shrimp hanging upside down, spread-eagled in the water, and not moving. The shrimp looked dead, but when the sub approached, the shrimp “woke up,” and moved its antennae and legs slightly. Though barely visible, these movements were just enough to keep the shrimp oriented head down as it sank slowly into the depths. Later on in the same dive they saw another shrimp doing the same thing. Then another. And another. Ben Burford, a former student intern at MBARI (and now a PhD student at Stanford University), was fascinated by these “zombie shrimp.” In fact, he was so excited that he wrote and published a research article about their behavior in the scientific journal PLOS One. Most shrimp shed their hard exterior skeletons periodically, and the unmoving zombie shrimp looked a lot like a discarded exoskeleton sinking slowly through the dark waters of the Gulf. Burford and his fellow researchers speculate that, by pretending to be empty skeletons, the shrimp might reduce their chances of being eaten by predators. The shrimp might also be saving their energy, since they live at a depth where seawater contains very little oxygen. In waters without much oxygen, many animals have a hard time moving rapidly or for long periods of time. 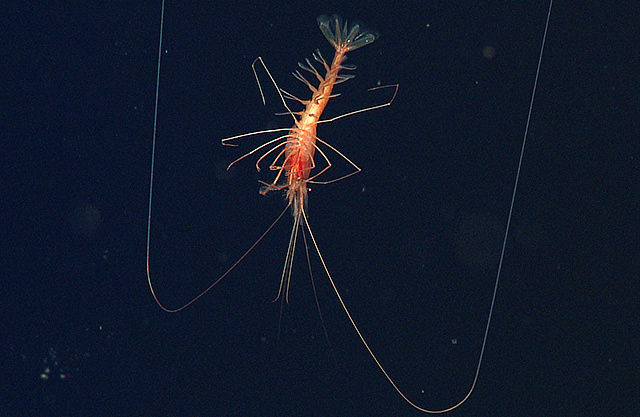 The researchers also noted three “zombie shrimp” drifting right underneath large mucus webs. Many deep-sea animals use mucus webs to collect marine snow (small particles of debris drifting down from the surface) for food. At this point, the biologists don’t know if the zombie shrimp created the mucus webs or were just hanging out near them. 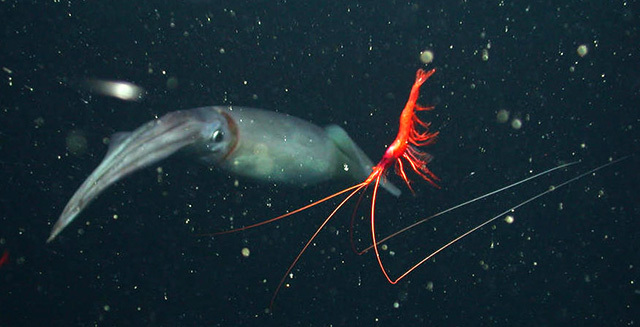 After seeing lots of shrimp behaving like zombies in the Gulf of California, the researchers looked through MBARI’s video archive and discovered that some deep-sea shrimp in Monterey Bay do something very similar. Apr 9, 2018 – Marine biologist Steven Haddock and his team have embarked on an ambitious project to understand the evolutionary history of ctenophores. Feb 20, 2018 – The United States Postal Service will unveil a new series of forever stamps highlighting the diverse and beautiful world of bioluminescence on February 22nd. Dec 6, 2017 – A new paper by MBARI researchers Anela Choy, Steve Haddock, and Bruce Robison documents the first comprehensive study of deep-sea food webs.